Thanksgiving is around the corner … need a sweet simple, easy peasy and pretty darn cute turkey to help decorate the table? 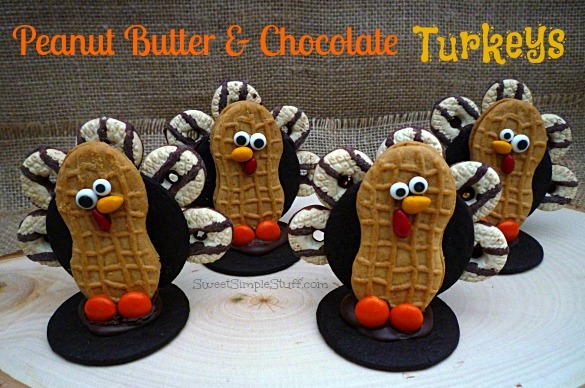 Well, you are going to love my Nutter Butter and Chocolate Turkeys! They can be used as place card holders, too … dessert and a place card (that is sure to put a smile on everyone’s face) all in one … bonus! These are not your typical place cards … fun, not formal … we are not a formal family! We may not be formal, but do set the table … even break out Grandma’s silverware and the “good” dishes. 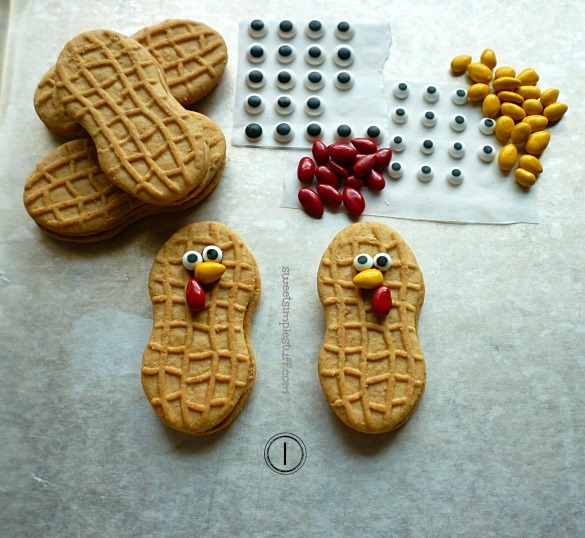 You can find the supplies to make these turkeys at most grocery stores. They can be made now and kept in an air tight container until Thanksgiving … they’re not just easy … convent too! I would recommend adding the name cards after placing them on the table, because they are just set in place (not attached). 1. Make the turkey head (just like we did for the Turkey Pops) – attach the eyes, beak and wattle with a dot of melted chocolate. 2. 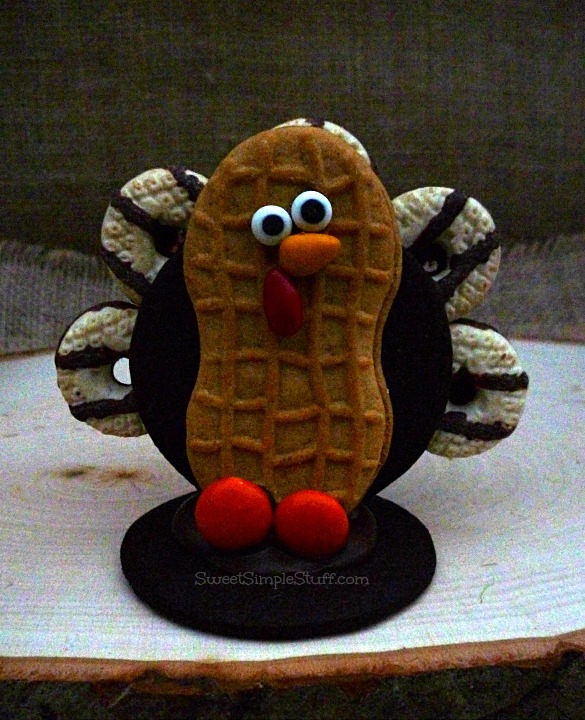 Attach the mini fudge stripe cookies as tail feathers – use melted chocolate on the stripe side of the cookie to attach it to the back side of the chocolate wafer, let chocolate harden. Use more chocolate on the backside to “reinforce” the tail feathers, let chocolate harden. 3. Use melted chocolate to attach the Nutter Butter to the chocolate wafer (keep bottom edge of cookies even). Attach orange candies (feet) with a dot of chocolate, let harden. To make turkey stand up – use a dollop (about the size of a nickel) of melted chocolate on top of a chocolate wafer – place turkey on melted chocolate and hold until set. 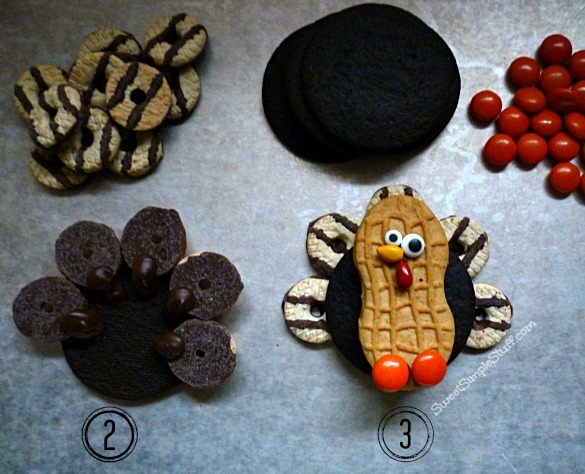 Hint: to help the turkey stand up quickly – place the turkey on melted chocolate, lift the turkey slightly and then place back down on wafer cookie. Do you set a formal table for Thanksgiving … informal … buffet? I love to hear your comments! 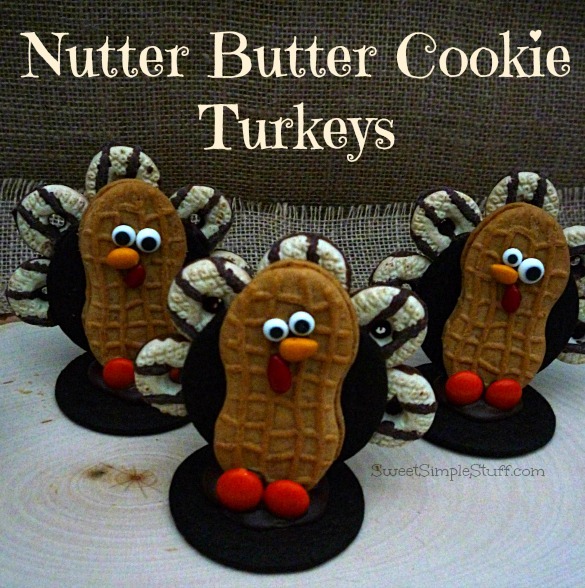 Another great way to make a turkey nutter butter. So fun! Thank you Beth ;). 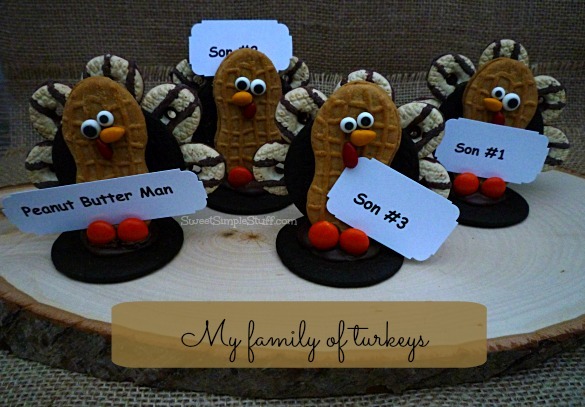 I always say … You can never have too many Nutter Butter turkeys!